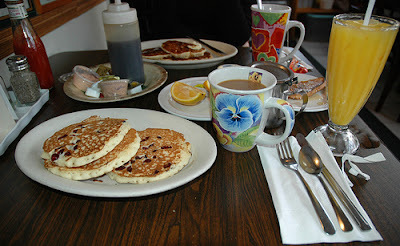 Get Some Cranberry Pancakes at Tom’s Restaurant. Despite the line to get in, Tom’s Restaurant is well worth the wait. For your troubles, the staff brings out trays of coffee and random food, like fries with chipotle sauce to snack on. This is the kind of love waiting for you inside. While being the place Suzanne Vega wrote the song “Tom’s Diner” about, the random photos of celebs and locals on the walls tell you this place is famous for other reasons. The menu, filled with breakfast and lunch items has an eclectic variety of pancakes like lemon ricotta or pumpkin walnut and egg dishes like crab cakes florintine. While Tom, the man who opened the restaurant in 1936 has passed away, it’s his son, Gus Vlahadhas, who currently runs the establishment, playing host, shaking everyone’s hand and joking around like you were family. Fortunately, the food here is as good as the line out the door would have you believe.